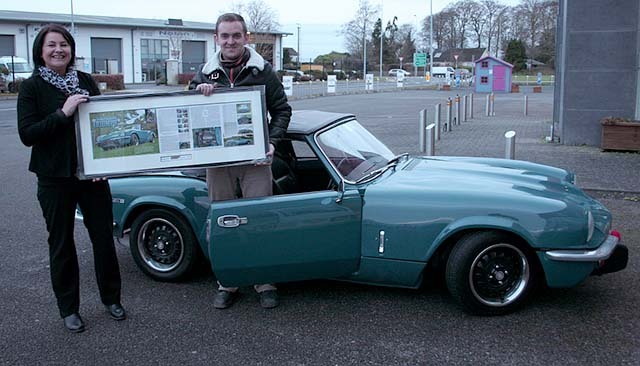 Classic car enthusiast Peter Heary’s 1971 Triumph Spitfire is his pride and joy. So when it featured in Ireland’s leading classic cars magazine, he was proud enough to want to preserve the article for years to come. That’s why he came to us, as he knew our magazine article framing service would fit the bill perfectly. Scanning all individual pages into a single print. An advantage of this option is that there is no discernible gap between pages. This is particular important if a photo or headline runs over two facing pages. Framing the pages individually in a multi-aperture mount. This will generally result in a larger frame since it also has to accommodate the mounts surrounding each individual page. The first option was best here, as the first two pages of the article featured a large photo of Peter’s car. We then placed the single page scan of the five individual pages in a surround mount. We added an inlay card and description as per Peter’s wishes. He next chose the frame colour and style he preferred, and we delivered exactly what he wanted. Overall, he was delighted with the finished item, and it now hangs proudly in his home. Magazine Article Framing for you! We were delighted to serve Peter in this way. We can do the same for you, with any significant magazine or newspaper article you may like to preserve. It doesn’t matter the size and shape, or the number of pages involved – just contact us, and we’ll take it from there! What is bigger, 6 or 4?